Wholesale Trader of a wide range of products which include rfid silicone wristband, single use pvc wristband, paper rfid wristbands, rfid fabric wristband and rfid band. Single Use PVC Wristband are disposable and perfect for access control and ticketing at races, concerts, museums, clubs, trade shows and sporting events. Single use construction made of PVC is disposable with read distance of up to 1 meter using an Alien ALR-9800 UHF reader (read distance varies based on reader type and application). One size fits all adjustable up to maximum 65mm diameter. Custom logo printing and different colors available. These single use PVC RFID wristbands are waterproof and have a read distance of approximately 15-30 cm (depending on reader). Suitable for applications where reading one wristband at a time (LF and HF) or many at a time (UHF) is desired. RFID access control, RFID ticketing and RFID stored value and credit applications. These low cost disposable paper RFID wristbands wear comfortably for several hours on tours, at museums, concerts and parties, at tradeshows and lectures and at product promotions and marketing events. 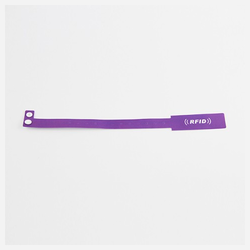 SE-0005-X Paper RFID Wristbands are single use and made of coated paper that is not easy to tear. 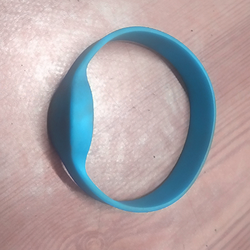 The plastic clasp secures the band at the desired size on the wrist. The clasp cannot be opened once it is secured. The wristband is cut to remove it from the wrist. The RFID tag portion remains readable after the wristband is cut. The SE-0005-X Paper RFID Wristband comes in five different shapes and sizes to address all requirements. When choosing a paper RFID wristband for your application, please consider the overall length of the band if you need them for both larger and smaller sized wrists. Please also note the dimensions for the branding area if you need to print logos or other information on the band. RFID access control, RFID ticketing, RFID stored value and RFID cashless venue applications. These wear comfortably for a few hours or a few days at an EDM, a music festival, concert or party, at theme, water parks and resorts and at trade shows and RFID experimental marketing events. SE-8829 one use fabric RFID wristbands are made of a cloth wristband with an RFID tag encapsulated in a housing that slides onto the band. Customer branding can be either woven or dye sub printed onto the band, customer logo can be printed on the tag face, serial numbers can be lasered onto band or tag to meet any requirement. Plastic clasp is used to secure the band so that it locks on and cannot be removed unless cloth wristband is cut to remove it from the wrist. RFID tag remains readable after the cloth wristband is cut. Optional re-usable clasp can make the band easy to put on and remove. 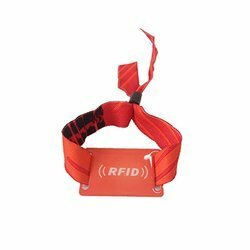 Looking for RFID Wristbands ?